The Coast Guard searched Wednesday for two people aboard a jet that plunged into the Atlantic Ocean off Florida after finding the bodies of two others who were on the medical flight to Mexico. The bodies of a man and a woman were found about three miles off the coast of Fort Lauderdale near the debris field from the Mexican-registered Learjet 35 aircraft on Tuesday, Fort Lauderdale city spokesman Matt Little said in an email. A statement from Mexico's Directorate General of Civil Aeronautics identified the pilots as Jose Hiram Galvan and Josue Buendia Moreno, and the passengers as Fernando Senties Nieto and Mariana Gonzalez Isuna. U.S. Coast Guard officials confirmed that the pilots and passengers are Mexican citizens and said they were working with the Mexican Consulate in South Florida to notify the next of kin. A single Coast Guard cutter was going to continue search and rescue operations overnight. “We've seen people survive incredible things at sea in the water for more than 24 hours, so we are still holding on to hope," Chief Petty Officer Ryan Doss said Wednesday night. He said earlier Wednesday that deteriorating weather conditions were making the search effort more challenging. National Transportation Safety Board senior air safety investigator Brian Rayner was also working closely with the Coast Guard. The plane took off from Fort Lauderdale-Hollywood International Airport at 7:51 p.m. Tuesday, airport spokesman Greg Meyer said. The jet, run by AirEvac International, was carrying two pilots, a doctor and a nurse who were returning to Cozumel, Mexico, Meyer said. Preliminary radar information from the Federal Aviation Administration shows that the jet departed heading east, went out over the water and turned north as it climbed to about 1,800 feet, Rayner said. “The airplane then continues in a northbound direction but begins a descent, and it’s not until the airplane has descended approximately 1,000 feet before it begins its turn to shore," Rayner said. "Shortly after that the last radar target is observed at 400 feet." In a distress call, the pilot tells the air traffic control tower, "We have an engine failure," and he requests permission to return to the runway. "We're going to do a 180 and we're going to land," he says. A few minutes later, in response to the tower's instructions, the pilot says, "Mayday, mayday, mayday." It crashed at about 7:56 p.m., Rayner said. The bodies were recovered at about 8:45 p.m., according to authorities. The company that runs the medical transport planes said their focus is on the victims, who had just picked up a patient in Costa Rica and dropped the patient off at a South Florida hospital. "These are people that are dedicated to saving lives," said Albert Carson, director of operations for AirEvac International. He said the company had sent documents to the Mexican consulate to try to identify the deceased, a process that continued Wednesday afternoon. Carson promised there would be an investigation and said the company would be "transparent and open." The company's main bases of operation are in Mexico, Central America and South America and San Diego, Calif., according to its website. Coast Guard Lt. Commander Gabe Somma said at a news conference Wednesday morning that 1,000 pounds of debris had been recovered. Meanwhile, Doss said debris was drifting as far north as Boynton Beach and said some of the wreckage may wash ashore. Crews were following the debris north along the coast between a mile and three miles offshore. Authorities had searched an area of more than 700 square miles since the crash, Doss said. He urged beachgoers to call police if they spot any debris. Dr. Fernando Sentíes Nieto, one of the passengers aboard the plane, is a well-known doctor in Cozumel, Mexico. The doctor’s family and his patients still have hope Sentíes Nieto is alive. “Please let’s all pray. [Fernando] is a fighter, I know that he could very well be okay. Please join us in prayer for him to be able to find him,” said Sentíes’ wife, Ana Beatriz Joaquín, on her Twitter page. One of his patients in Mexico, Liz Noble, says she was shocked when she heard the news. “This is terrible, I’m just hoping for a miracle,” said Noble. Noble says Sentíes Nieto is a hardworking doctor who always made himself available to his patients. “If he was traveling and I needed to reach him, I would always send him messages on WhatsApp,” said Noble. Noble said Sentíes Nieto is also well-known because of his marriage to Ana Beatriz Joaquín. Joaquín’s brother is the former municipal president of Cozumel. Nine vessels and five aircraft from several agencies were used in the search Wednesday afternoon. Doss said the Coast Guard planned to continue searching throughout the night, and then re-evaluate the situation on Thursday. 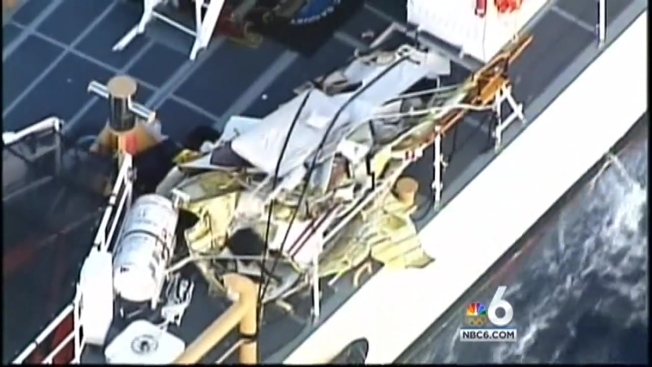 Below: Wreckage from the plane is brought aboard a Coast Guard boat. U.S. Coast Guard photo.